Happy Friday!! Another week gone...they go way to fast! I had all week to myself and where did it go?? Well, I did bake a batch of cookies yesterday (oatmeal scotchies, my favorite), and wanted to take some up to Margaret at Sparkle n Sprinkle. I remembered this project after the fact, but still wanted to do it. 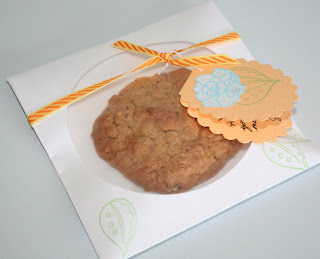 I had seen somewhere, someone had used CD envelopes to put individual cookies in and had been wanting to do it. Had I thought before hand I would have made the cookies bigger....next time. Anyway, I stamped a little on the envelope and made a little card with my Nestibilities. I stamped the flower on white with versamark and embossed it with Baby Blue EP and watercolored it with the Pearlescent watercolors. Those watercolors are so pretty and iridescent in real life. 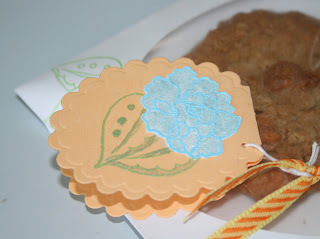 I cut out the flower and glued it on the leaves which I stamped using masking. 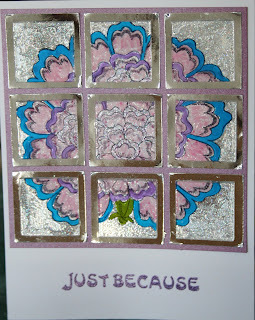 I also used the Brillance ink which is shimmery on the leaves. I did end up putting some cookies in a ziplock to bring also....I didn't just take her one! lol Who can eat just one?? Not me! Okay, I need to make a correction. I posted this card a while back (see it here) and posted that I used the Sparkle n Sprinkle brushable glue and didn't think it really dried clear?? Well, it does!! After a couple of days it did turn clear. I guess because it is pressed between two air tight pieces (the acrylic inchie and the mirror cardstock) it just takes a little longer to dry. The card is gorgeous now and sparkles like crazy!! Have you tried the inchies yet?? Send me pictures of what you have done and I will post them for others to see.